in nicaragua, got a bit of surf in this morning, heading to costa rica today. hope to find time to get posts up. no time for computers at the moment. The part for the truck came into Belize City the other night, but did not clear customs, so we headed to Belizecustoms and then get to fixing the truck. The part cost about $900.00 US to buy and get sent here, at customs they wanted to charge us a further $250.00US to get it out, we explained that the part wouldn’t be staying in the country and the truck was leaving as soon as we could fix it. We where then sent to the senior officer, Mr Tillet to resolve the issue, without a second glance Mr Tillet signed it off and at a administration fee of $30.00 Belize ($15.00 US) we were out the door . We had a nice drive back to Dangriga along the Coastal RD; however we damaged a part on the Suspension when we hit a large rut a bit too fast. On arriving back in Dangriga we headed to the great mechanic around the corner from the house where we were staying, this guy let us use his property and his tools (just the ones we didn't have) so Ian could Replace the throttle body and fix the Airbag in the suspension. 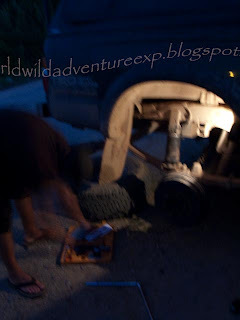 We worked well into the dark; though there wasn't much I could do Ian new his truck and the parts. At about 7.30pm we were done and the truck was running great. today Ian and his dog Buddy (shogun) the Shiba Inu, rolled into Dangriga Belize. they had just driven from Wyoming over the last couple of months via Baja. they where tired and sick of driving when they arrived and had some good story's of adventures and mis-adventures in Mexico. the truck had some issues, its throttle body ;which controls the air intake for the injectors; was stuffed and the truck wouldn't run properly, but got Ian and buddy here to Belize, just. now we need to fix it before i can join them on the mission to Panama of the next 10 days.